"This is an excellent lunch box salad (my husbands favorite)!" 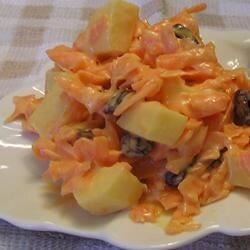 In a mixing bowl, combine the carrots, celery, raisins, mayonnaise and vinegar. Mix together and refrigerate until chilled. An old familiar favorite. I leave out the celery and add a few teaspoons of sugar to the dressing. Sweet but good and a nice way to get some more veggies in the diet. I liked it, but it needed more flavor...maybe sweetener or pineapple. I think this recipe is better with Miracle Whip than mayonaise. i would add a little pineapple to my salad. i like juicier carrot salad. I took everyone's suggestion and added a small amount of crushed pineapple. I also added a little salt and pepper and some cajon spices for a little kick. I like to add pinapple tidbits and mini-marshmallows to this for the kids. It is a real HIT with them then. Ucky! IT was soooooooo bitter!